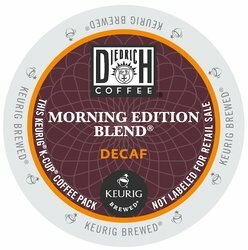 Diedrich Coffee - Morning Edition Decaf - K-Cups. A full-bodied decaffeinated coffee with a creamy vanilla sweetness and a hearty finish. Each box contains 24 single serve K-Cups.